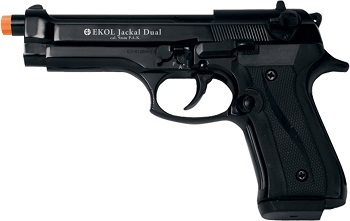 Image Below Or Add To Cart Front Firing Fully Automatic Blank Firing Gun Beretta V92F Jackal 9MMPA Replica-Ekol Jackal Dual Black Finish: The New Front Firing Jackal Fires flame and smoke from the end of the Barrel. All blank guns sold in America must have the red tip at the end of the Barrel though it is my understanding that if the item is used in the theatrical, movie, or television industry the red tip can be removed. Our New Beretta Front Firing V92F Jackal Replica Blank Gun Fires 15 of our 9mmPA Blanks in 1.9 seconds. This was the world's first, fully automatic machine gun pistol simulator. Hold the trigger down for Fully Automatic rapid fire or Fire Semi Automatic when you prefer. Fully automatic mode means that as long as you just hold down the trigger the Jackal will fire and reload automatically and continuously until you release the trigger like a machine gun. Semi automatic means it will fire and reload each time you pull and release the trigger. You just move a switch to set it back and forth from full auto, semi automatic or safety mode. It is really simple. You will love the Bold Detailed Design and Heavy feel of Our Full Metal Jackal V92F Beretta Fully Automatic Replica. All of our Blank Guns are all made of metal. The Jackal is great for gun or firearms training, security, defense or rescue type scenario gun drills, military/armed forces and police/law enforcement training, and theatrical or prop blank gun or just for having fun. Length 8 " Weighs 3 lbs, Rounds 15, It comes with a Magazine and Hard Shell Carrying Case: There is an optional 25 Round Magazine available for this Model.